Are you tired of wasting time trying to make money on the internet while thousands of people are making hundreds of thousands of dollars every month and seem to do nothing at all? Have you done everything from trying to run a blog to freelancing but never being paid enough for your hard work? Do you envy internet entrepreneurs who keep uploading their videos on Youtube showing themselves having the fun of their lifetime, going to exotic locations but not telling anyone what exactly they are doing to make all this money? Have you wasted money buying crappy ebooks and doing trainings that claim a lot but are not worth a single penny? Behold! Look No Further, Because Now You Have It All! Buy the Ultimate Powerline Member to Member Payment Script right now and see money falling into your lap like never before. 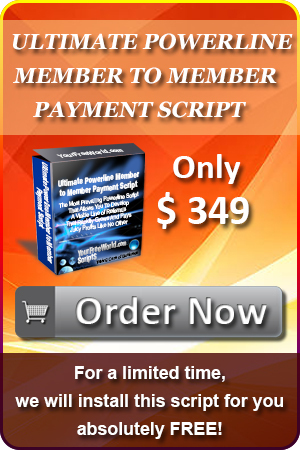 How does Ultimate Powerline Member to Member Payment Script work? This is the first question that pops in your mind right when you hear this name. So, you have a domain, you install this powerline script, set the outlook of your website from the admin panel which does not take long and you are done. All you have to do next is to invite people to join your website for a little fee. This joining fee goes in your pocket. You can setup 1-up or 2-up as well. If you have 1-up, for anyone who joins next to your member, you get the fee. Why would anyone join your site at all? Just the way you make money from memberships, they will also be paid for the people they invite and not just a little part of it, the whole membership fee goes in their pockets. With 1-up working for your direct members, they get 100% of the joining fee the referral of someone they referred. Is that all what this powerline script can do? Not at all, the next thing to do in this powerline script is recommending all your members to other products you have to offer. If they buy something, you get the commission; if they refer your recommended products to someone, you both get the commission. So, in no time, you develop a chain of people who are looking for offers from you to buy or sell, making them money and making you a huge amount of money. The new luxury car you dreamt of, the house you always wanted, or all the places you wanted to go are so close from here that you could just stretch your arm and grab them all. No prior experience needed, setup everything in just a few clicks and start making money in a few hours. So what are you waiting for? From this moment onwards, you are losing money on every second you waste. Setup payment details for Paypal, Payza, SolidTrustPay, PerfectMoney, Bitcoin and up to 5 other merchants of your choice. Define your own Membership Levels with different admin fee and referral fee. Setup different Powerline Structure for each Membership Level.